I visited Evergreen Museum yesterday. I was able to take a self-guided tour of the museum. It was amazing to see the details of the home up close and personal. The design of older homes is just amazing. 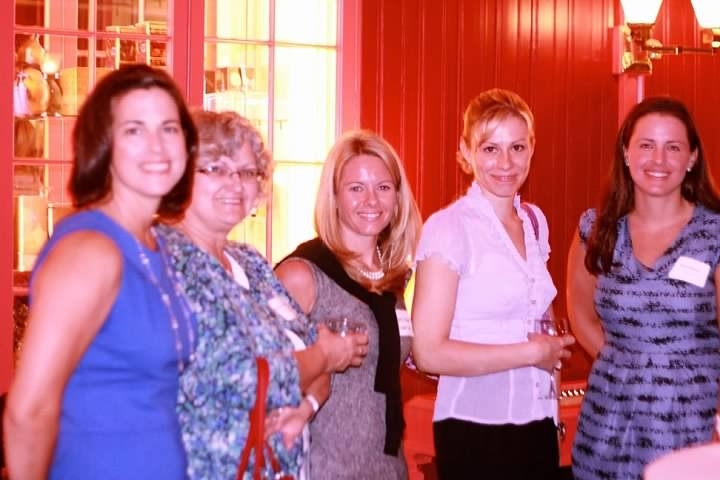 I’m the tall blonde in the purple blouse. As part of the tour I learned why you should consider Chubb Insurance Group to insure your older home. Do you know the differences between a Georgian home versus a Queen Anne home? The appraisers at Chubb sure do. Not only do they know the difference but they can also tell you alot about the architects and designers of those types of home, and the cost to replicate the home today. They are truely experts in their field. If you have an older home you should consider Chubb. Call me for more information. I am dirt/germ phobic. I like things clean, super clean. I can’t do dirty touching clean either. I immediately feel the need to sterilize the clean again. That sounds really bad but it’s the truth. Case in point- the weather is starting to shift slowly into fall temperatures. Its not as hot as it has been this summer but the temperature still reaches 80 degrees mid day. I was away this weekend for a much needed girls weekend and when I returned home I found a sleeping bag on the bed. Per my husband it is snuggly soft and helps him sleep. This is not any sleeping bag. This is a below zero, heavy, fluffy thing. We use it camping every year and I haven’t cleaned it recently. Reason being, when my husband hunts everything has to be non-scent, including the sleeping bag. That big fluffy sleeping bag that smells like dirt and wilderness was on my bed. I practically had a nervous breakdown and sterilized the entire bedroom. Is that strange? Friends have said wait until you have kids. You think a sleeping bag on your bed is bad, kids will make sure you have nothing clean. I refuse to believe this. With my OCD, neurotic, cleaning habits that can’t be possible. We are in the second week of school. Some parents celebrate while others cry. 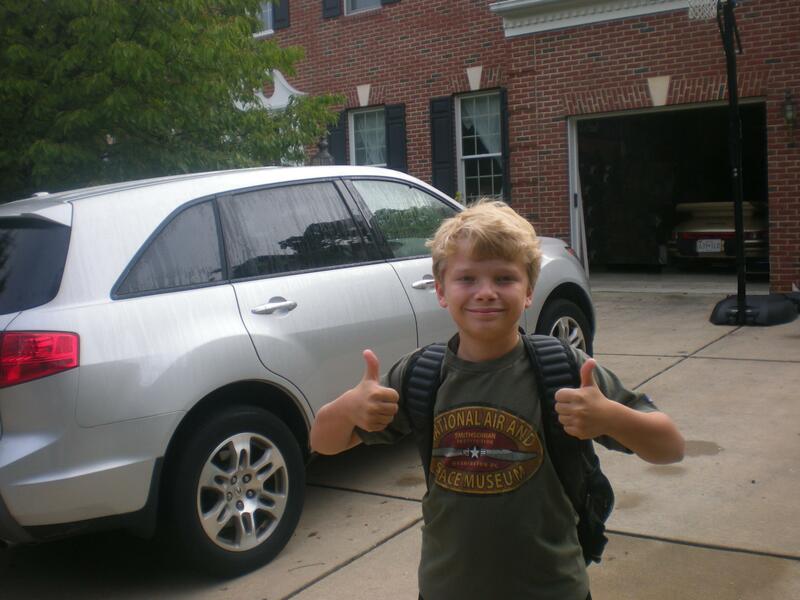 The school year started with two thumbs up. But since my son doesn’t like school I’m one of those tense parents who holds their breath until the report comes in. We live in a community where the kids walk to school and this year Michael is a safety patrol person complete with vest and badge. His shift should be 3:20-3:30 but yesterday he refused to “leave his post” until everyone was gone. Something about no man left behind! The school gave him a book on safety and suggested a website (which I’ve noted below) as we reviewed this information. I was surprised how much he had learned from his neurotic mother aka ME! But I was also surprised by the injury statistics did you know- In Maryland on average 2 children are killed every year during school arrival and dismissal times and more than 150 children are injured. So please review the safety rules with your little precious gifts. Watch out for pedestrians, busses and dogs. If you happen to hit one with a car you might be surprised to learn that the first 2 situations are considered collision claims and the last comprehensive. Hears hoping your school year is happy and healthy and that mine doesn’t end in a nervous breakdown! 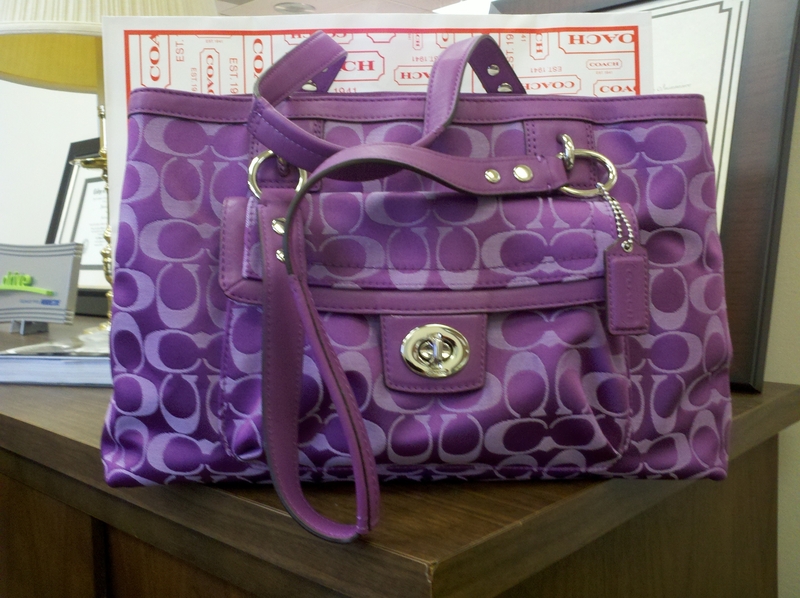 It’s official… I have my first Coach purse! It looks so pretty and it has that new smell. Its so sleek and stylish. Eeeek! See for your self. Are you jealous? I would be if I were you and didn’t have a Coach purse. Lol! So now I have another purse but not any purse… A Coach! She will go right next to my Guess and Jessica Simpson purses. Now here is the lesson…. This precious purse is an investment, despite the fact that I got it 80% off. I would like to protect my investment. I know a major way do to so… homeowners insurance. Your homeowners insurance policy should have replacement cost coverage for contents, so that when my precious Coach bag is lost or damaged my homeowners policy will pay the full price to replace it. Time to go show off my new stylish, Coach purse. Greetings everyone! And welcome to Insurance Divas. Let me introduce myself, I’m Michelle Morrison and one half of this dynamic duo. While I don’t leap tall buildings in a single bound I do work full-time, run a home, I have a 10 year old boy, and my husband of 28 years, whom you are likely to hear about. I have 25 years of experience in Claims, Risk Management. And during this long career have touched on almost all lines of coverage. I hold a Property & Casualty insurance license and C.P.C.U designation, which stands for Chartered Property Casualty Underwriter. My younger tech savvy and beautiful partner in this endeavor is Pamela Dodge. Pamela brings 10+ years of experience to the table in personal insurance. She is tenacious, hard working and always an advocate for her client’s best interest. Pamela holds a CISR, CPIA and ABC designation (I just made the ABC thing up). Pamela is newlywed, always happy and singing………….did I mention she is a newlywed. I’m sure after 28 years she will adjust accordingly. Pamela and I have worked together for almost 2 years and are like peas and carrots, I’m the carrot! We are experts in the field of insurance and we’d like to share our expertise with friends, family and “others” since our friends and family don’t or won’t listen. We are part of an independent insurance agency located in Maryland servicing all 50 states. In an effort to keep up on the trends we have decided to start a blog hoping to share our thoughts on insurance…….I know what a snoozer………worst than a used car salesman trying to sell you a 20 year old classic driven by his grandmother on Sundays. But, it is one of those things that you should know about. Your mortgage company requires you to have homeowners, the state requires auto insurance, government and contracts want you to provide commercial and workers compensation….not to mention your spouse who wants you well insured because they are secretly planning your demise, the list goes on and on. On that planning your demise thing, you can go to prison for stuff like that! While I may complain and tell Pamela I’m only doing this to “shut her up” the truth is I’m only doing this to shut her up………plus I think this could be fun. We hope to share our lives and experience in this blog and hope you join us and follow along.